As the summer travel season winds down here at Fiddlefreak World Headquarters, the time comes to buckle down and catch up on reviewing some of the lovely and wonderful new recordings that have piled up on my desk. 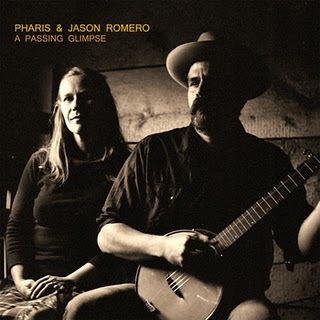 First up: Pharis and Jason Romero’s new release titled “A Passing Glimpse” (Lula Records). I fell for this one immediately. With its low-key old-timey feel and a mix of original and traditional material, A Passing Glimpse delivers a mellow Sunday-morning buzz that falls somewhere between Gillan/Rawlings and Jenny & Billy. Close harmonies blend smoothly with guitar and banjo to create their warm, homegrown sound. Jason Romero first came to my attention through his artisan banjos, and Pharis through her membership in her oldtime band Outlaw Social Club. After stints in Chico and Arcata, CA, Jason migrated northward though Portland and settled with Pharis in the remote outpost of Horsefly, BC, where they create beautiful instruments and music. Their previous releases include Shout Monah from The Haints Oldtime Stringband and Back Up and Push, an ambitious collection of fiddle tunes from sawyers all over the West Coast, previously reviewed here. Here’s that song, and another. Hope you enjoy this listen! LISTEN: Where Is the Gamblin’ Man?